The highlands of South West Cameroon are a biodiversity hotspot that harbours unique but endangered species such as Cross River gorillas, chimpanzees, drill monkeys, forest elephants but also rare birds, amphibians and butterflies. The African Conservation Foundation (ACF) and Environment and Rural Development Foundation (ERuDeF), in collaboration with the Ministry of Forestry and Wildlife (MINFOF-Cameroon), have since 2004 been working together to secure the long-term survival of the last great apes populations in the Lebialem Highlands. This collaboration led to creating the Tofala Hill Wildlife Sanctuary in 2014, the creation of two out of the four ear-marked community forests in the Tofala-Mone Wildlife Corridor and currently supporting the creation of the proposed Mak-Betchou Wildlife Sanctuary. Collectively, the Tofala-Mone Wildlife Corridor and the proposed Mak-Betchou Wildlife Sanctuary host over 600 Nigeria-Cameroon chimpanzees, 40-60 Cross River gorillas, over 100 African forest elephants, populations of Drills, Preuss monkeys, and a host of other globally threatened species that include amphibians, flora and birds. The collective surface area of these three conservation areas stands at 48,163ha. 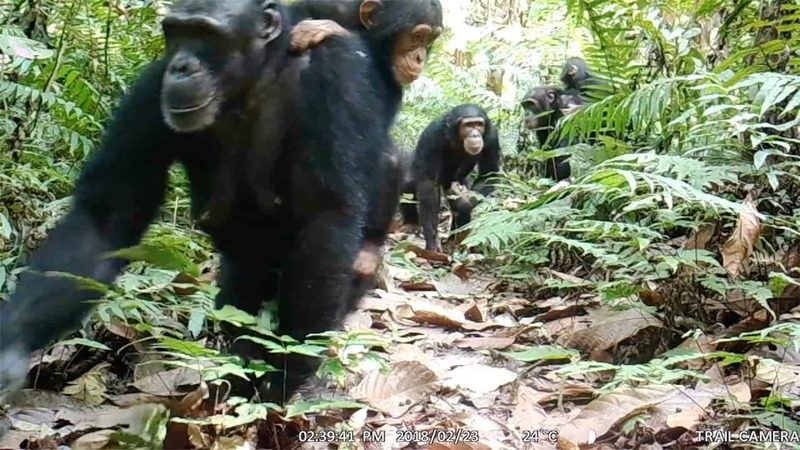 An increasing number of Cameroon Nigeria Chimpanzees are being captured on camera traps in the Tofala Hill Wildlife Sanctuary. During the last survey in this sanctuary, a large group of 20 chimpanzees was caught on camera trap footage. The number of chimpanzee is growing as a result of increased birth rate. There is also possible influx of animals from the Mone Forest Reserve through the creation of the Tofala Mone Corridor which we are developing. Groups of chimpanzees can merge to form larger groups when human encroachment, hunting and threats are reduced and food availability is increasing. Monthly surveillance and patrols are carried out by Government and community rangers which often last 15 days in a month. To this end 6 hunters in the forest adjacent communities have been recruited and trained to participate in forest surveillance and patrol – converting them into conservationists. According to Forest Research officer Floribert Assongacap, a notice has been issued to all farmers having farmland in the forest to move their farms out of the forest. Alternative sources of income have been developed with local community members by providing training and donation of piglets and bee hives, as well as training of women groups on soap and detergent production. Snaring, expansion of farmlands and human-wildlife conflicts remain the biggest threats to the chimpanzees, Cross River gorillas and other wildlife in the area. Many cases of plantain destruction by great apes have been recorded in the area. Fortunately, hunting gorillas and chimpanzee in communities around Tofala is a taboo. The local communities involved in the project include four principal ethnic groups namely the Bangwas, Mbos, Mundanis and the Banyangs. According to their culture and traditions, great apes are regarded as totem animals. Snaring however is a serious problem. “Snares are set in the forest for small mammals such as rats and porcupine, but this turns to injure non-targeted species like the chimpanzee and gorillas,” says Gwendolyn Angwa. 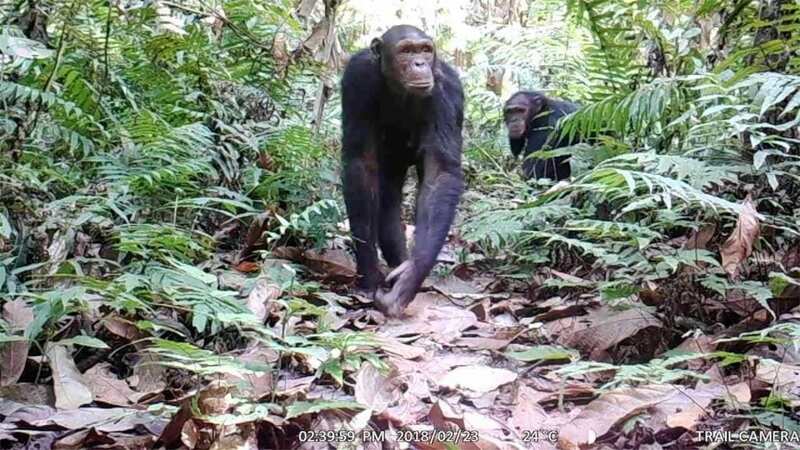 “In one of the videos recorded in the last survey, we noticed a chimpanzee with a broken arm and it’s certain that is a result of snares.”Get involved and help the chimpanzees and Cross River gorillas in South West Cameroon. The current Cameroon crisis threatens great apes as displaced people flee to protected areas, clearing forests to build homes and hunting endangered animals for survival. We can stop the extinction of great apes wildlife – but we need your support. Please donate today so that we can take action now. You can also join us as a volunteer in Cameroon.